Kale is a member of the cabbage family. It is eaten as a leafy green just like spinach and Swiss chard. 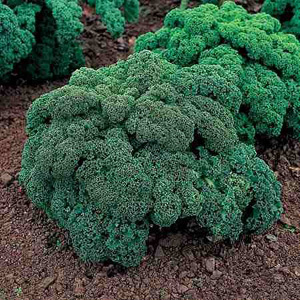 The problem with kale is that it does not do well in warm weather, so a spring planting is not always successful. 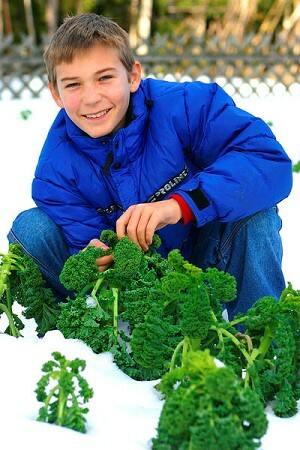 Our advice is to start with growing kale as a fall crop when it will thrive with the days becoming cooler and cooler. kale can be tall or short; highly curled or plain leaved; it can be blue -green, yellow -green, or red. One of the advantages of kale is that it will grow well with just five hours of sun each day. So if have a place that gets part shade you can grow kale. If you want to try kale in the spring you need to start seeds indoors at least eight weeks before expected last frost. This allows you to put out seedlings about three weeks before last frost and be able to harvest kale before it starts getting too hot. As we said our preference is to grow kale as a fall crop. We plant seed directly in the garden in the last week of June or first week of July. This is a crop that will benefit from having shade cloth protecting it through August. As the seedlings grow we thin the plants to about 10 to12 inches apart. The tender thinnings are tasty in a salad. 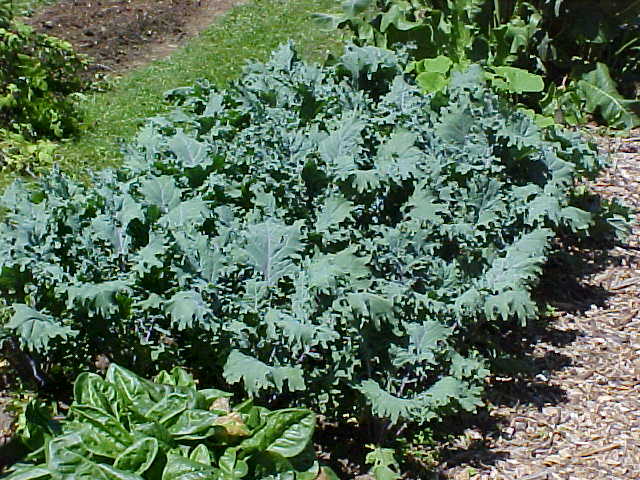 Kale to is considered to be a heavy feeder. That means when you put out seedlings in the spring or when you plant the seed in late June you well spread a cup, meaning a handful, around the seedling or along the seed bed; lightly spread. Then for the fall crop you would spread about half as much fertilizer around the plants in September. Just as with all vegetables if you want to have the healthiest plants you will give them a foliar spray once a month with a fish or fish and kelp liquid fertilizer. You can begin to harvest the outside leaves when they get to be the size of a playing card. By harvesting just the outside leaves the plant will continue to produce well into the late fall. Kale actually tastes sweeter and milder after it has experienced the first frost. If you surround each plant with two or 3 inches of chopped leaves or straw your kale will probably produce until early December no matter how much snow you get. Kale is usually prepared by steaming and then served with butter; some folks like to sprinkle it with a bit of vinegar. Kale is also a great addition to any vegetable soup. if you find that many little holes or perforations in the leaves of your plants, the plants may have flea beetles. Flea beetles are 1/10 of an inch long, shiny, and black, and may have yellow or white markings they are very active and jump like fleas when disturbed. Their feeding can destroy small plants rapidly. See controlling flea beetles. If the foliage on your plants curls, puckers, and turns yellow, and the foliage and blooms become stunted, look out for ants. They are a sign that your plants have aphids. Ants are attracted to a sticky honeydew secreted by aphids. The insects have soft, pear shaped bodies about the size of a pinhead. They may be green, brown, or pink,. You will find aphids in clusters on the undersides of young leaves him. See controlling aphids. Small ragged holes in leaves indicate that your plants may be infested with cabbage lopers. the cabbage looper is a 1 1/2 inch long Caterpillar that is light green with long yellowish stripes on its back. It loops as it walks. See him controlling cabbage loopers. Large ragged holes in the leaves of kale, trailing dark green frass, or excrement behind them. The worm is light green with one yellow stripe, and measures 1 1/4 inches long. The adult is a common white butterfly with 3 to 4 black spots on its wings that is active during the day. See controlling imported cabbage worms. Skeletonized leaves on your kale plants indicate Mexican bean beetles. The adult is 1/4 inch long, round, and has yellow to gold to copper coloring with 16 black dots in three rows down its back. It looks somewhat like a ladybug. It lays a yellow eggs in clusters on the under sides of leaves. The hump backed, fuzzy larvae are orange or yellow and measure about 1/3 inch in length. Both the adults and larvae chew holes in leaves. See controlling Mexican bean beetles.